The one thing holding you back from soaring in the sky is the concerns of your friends and family; luckily, you can tell them that skydiving is actually one of the safest sports out there! If you have to get your mom's approval, here are the safety precautions and statistics you can share with her before your first time skydiving. Stats: What are the chances of an accident? Skydiving continuously improves their safety precautions and technology in order to make your first time skydiving an enjoyable, safe experience. It's an incredibly regulated sport with safety at the forefront of everyone's mind. 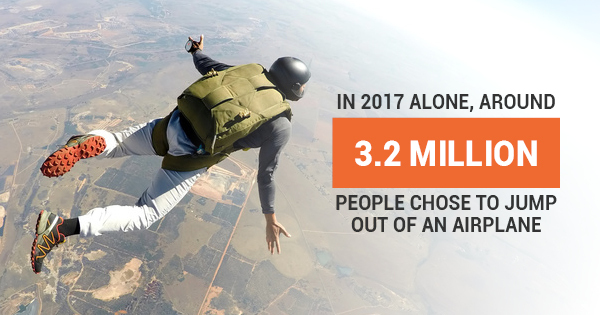 In 2017 alone, around 3.2 million people chose to jump out of an airplane; less than 25 of those who jumped resulted in a fatality. That means you have a .0000075% -- or one in 100,000 --chance of dying during your first time skydiving. To put that in perspective, you have a one in 6,000 chance of dying if you drive in the United States. Statistically, this just goes to show how safe skydiving truly is in the present day. Will I have to take classes? Every first time jumper should be required to take even a five-minute safety class to prepare them for the jump. This will help ease any concerns and establish communication between the first time jumper and the professional. Although rigorous course-training isn't required, the basics are covered to ensure the safety of both participants in the tandem jump. For those who want to become a skydiver, Jump Florida Skydiving offers a program geared toward those who want to experience a solo jump. Call them or visit their website for more information. How does a company ensure my safety? When you visit a skydiving center, they take many precautions to ensure you're protected. Skydiving centers must be certified by the United States Parachute Association (USPA) and all professional instructors will have also received certification. For a first time jumper, you will jump out of an airplane with a professional skydiver, an activity known as tandem skydiving. You will be strapped to the front of the professional who you will be able to talk to throughout the entirety of your jump should any problems occur. Additionally, they will have access to speak to people on the ground and in the air who monitor your fall. After you fall for about a minute, your instructor will employ your parachute. Then you will drift safely to the ground for the remainder of your jump. Skydiving can seem scary, but you can assure your mother that it's really one of the safest sports you can perform. If you're looking for a skydiving center that offers safe, professional experience, consider calling Jump Florida Skydiving today.